LinkedIn sourcing is a mainstay for any search firm or recruiting team worth its salt. Executive recruiters and sourcers depend their ability to access the information, especially those who are premium LinkedIn users. 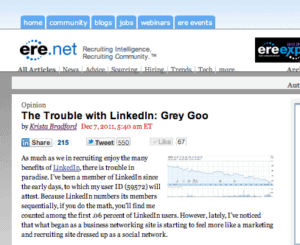 However, a few days ago, LinkedIn turned out the lights for recruiters and sourcers. For a while, those of us who login daily stumbled around in the dark wondering what to do. Glen, we are experiencing that here at Microsoft right now with the Recruiter accounts. Honestly, I wouldn’t put it past LinkedIn at this point to re-introduce ‘copy/paste functionality’ as a paid feature after this move. Perhaps if we collectively make a big enough stink about this, they’ll reverse the decision. We’re experiencing un-selectable text here as well . . . at our recruiting research firm Intellerati in Connecticut. Thanks, Glen, for your superb documentation on a work-around. My issue is the following: 1. We helped build LinkedIn. They are penalizing the super-users who are the very people that evangelize their product and who serve as a powerful magnet attracting users to LinkedIn. Unlike Facebook where the vast majority of users login daily, only a small percentage on LinkedIn do. (That would be us.) 2. I am a paying customer. 3. Their security settings are idiotic. They cloak 3rd degree names that are visible in public profiles. So where’s the logic? The choice is pay and we hide the name as our way of thanking you or don’t pay and you get to see the entire profile because the member has chosen to make it public. Not only that, as you have documented so brilliantly, LinkedIn is also attempting to prod people to increase their privacy settings. Who’s the genius that came up with that brilliant move? If you encourage people to do things so that they will be found by fewer and fewer people, that would seem to me to be an invitation to shrink, not grow, a social network. Our “issue” with LinkedIn has to do to with how it attempts to be the arbiter of relationships. To this day, LinkedIn asserts in its list of user agreement “Do’s and Don’ts” that one must not invite “people you do not know to join your network”. They assert the “legally binding” right to define how one must “know” an individual, and will (as it once did to me years ago) kick you out of the network without warning or explanation should someone forget how you two met at a conference. LinkedIn knows very well that a significant portion of its member base really does want connect with people they do not know. Clearly, members who indicate they’re open to career opportunities want to network with recruiters — people they don’t yet know but are eager to meet — an activity that I sense is one of the leading drivers of growth in LinkedIn membership. By comparison, while it is by no means perfect, Facebook defers to its user’s own ability accept, reject, or ignore friend requests and to friend and unfriend people at will. While LinkedIn’s skewed take on relationships is a disconnect that dates back to the very beginning in the fine print of its user agreement, a growing number of users just now are waking up to that reality. Consequently, when LinkedIn made text impossible to select without first announcing when or why it would do such a thing, users on the site thought it might first be a technical issue — some small bug or glitch —and then it dawned on them. 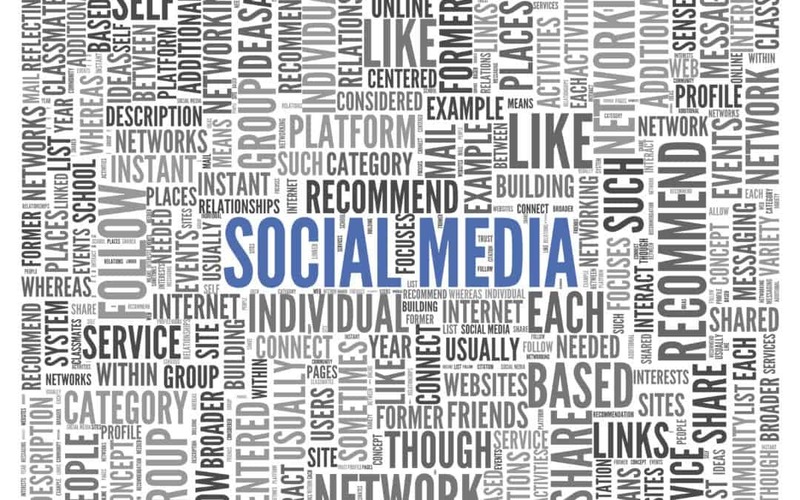 Social networks are built on trust and trust is a fragile thing with connections “loosely joined” on the Internet. We may be Facebook “friends”, but we don’t really hang out. We may network on LinkedIn, and for the ability to do so, we may have uploaded our entire business “social graph” to LinkedIn. But this latest move by LinkedIn and others like it are not “right purpose”. LinkedIn explained they decided to make text un-copy/paste-able to protect the “data and privacy” of its members and “of the LinkedIn website”. Actually, I don’t think so. Redacting data in profiles that LinkedIn users have chosen to make public is not acting in their best interest. Quite to the contrary, it is doing the opposite of what members have said that they want. Interfering with the ability to copy/paste to hinder networking is not acting our best interest. In other words, LinkedIn’s turning out the lights has nothing to do with us, and everything to do with LinkedIn,which is why our rant on Boolean Black Belt continued . . .
4. How is it that I cannot select data of my first degree connections or for public profile data that LinkedIn users have chosen to share with the world? Remember, all of the data that they’re steadfastly shutting off access to is only in the database by the grace of every user. (Well, that and they did a pretty good job of vacuum-cleaning up every name in our Outlook with ‘nary a thank you . . .) 5. I’ve noticed in Google search results that my public profile doesn’t have a Google cache link for the page. What’s up with that? Is that something that also has gone the way of the buffalo? I thought one reason people participated in LinkedIn was to “brand” themselves and to enable others to find them for business purposes. If LinkedIn text is not selectable and if, in so doing, they make it not indexable or if LinkedIn slowly disappears its public pages from Google cache as appears to be the case with my public profile, then how are people going to network? I mean, seriously! Even more important to LinkedIn, how are people going to find LinkedIn? It appears the social network is becoming decidedly anti-social as it attempts to monetize its recruiting business. We should take LinkedIn’s move as a cautionary shot across the bow and remind ourselves about the many implications of LinkedIn entering the recruiting business. Randomly doing stupid things like throwing a switch so that the UI frustrates its most loyal customers is a very risky move on their part. Social networks can turn on you. But apparently treating its relationship with us as disposable is the thanks we recruiters get for being the very reason so many people come here. LinkedIn is taking our money, our business relationships, and competing with us and as it does, it will continue to shut off access in every way it can so it can jack up its fees, even if it is to information that is otherwise public. Whenever Facebook has introduced a change that was an overstep, users objected en masse and Facebook,to some degree, relented. Perhaps its time we expressed our disappointment in their misbehavior. Alternatively, we can take our toys and go elsewhere. Google+ keeps looking better all the time . . .
And then, just as suddenly as it began, it was over. We awoke today to discover LinkedIn had turned back on the lights. We could see again because we could copy/paste again for legitimate business reasons. Because in the end, the information belongs to us, to our friends, and to friends of friends, not to LinkedIn, no matter how hard it tries.